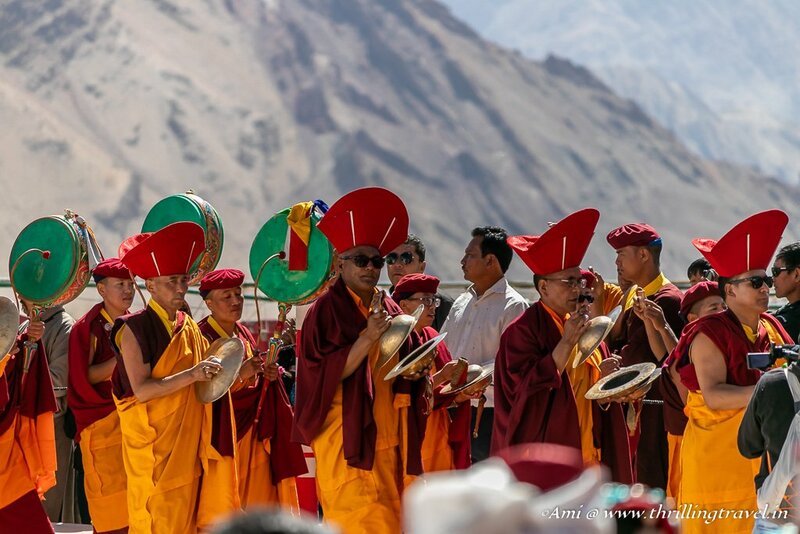 If the vibrancy of Hemis Monastery left you enlightened with knowledge, it is time to experience the colors of a famed Buddhist Festival – the Naropa Festival that is celebrated here. In my last post, I left you with a glimpse of these colors. 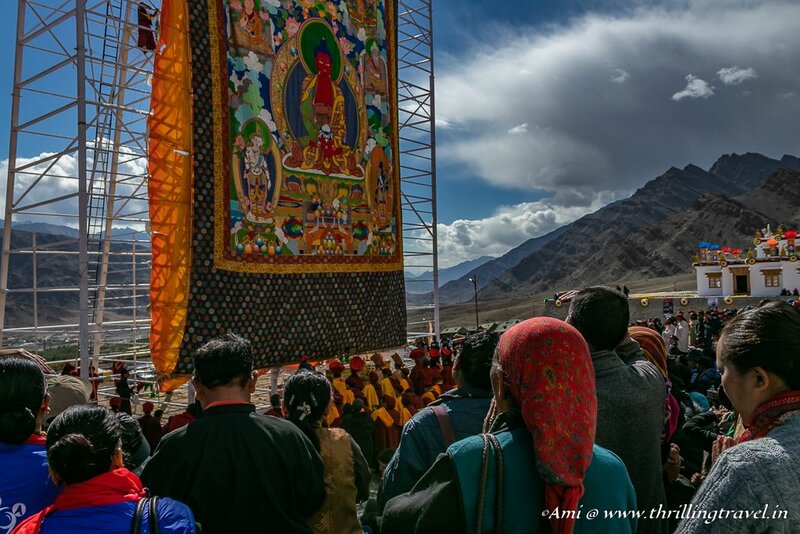 The huge Buddhist Thangka unfurled at the Kumbh Mela of Himalayas stood in all its glory over the 5 days of this Ladakh festival. And along with that came some amazing sights and experiences. 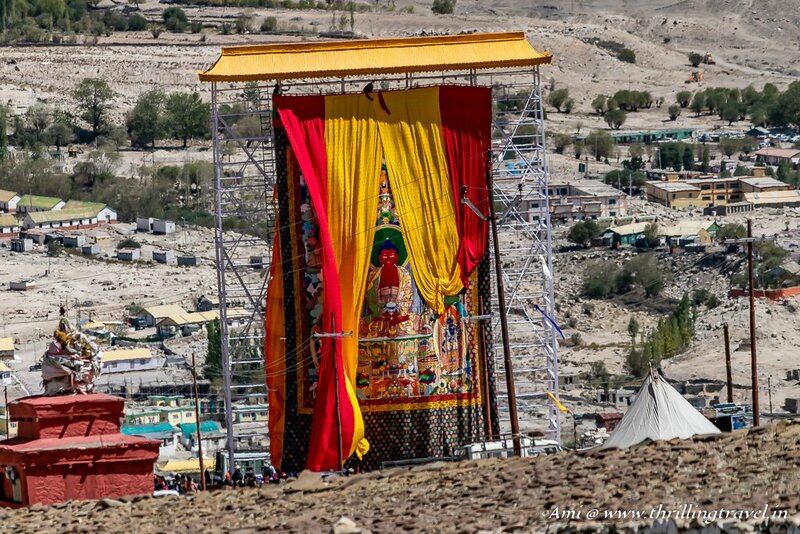 The Naropa Festival of Ladakh celebrates the life of a renowned Buddhist scholar and monk – Naropa. While the 2016 celebration was a grand one, what I experienced this year was no less. 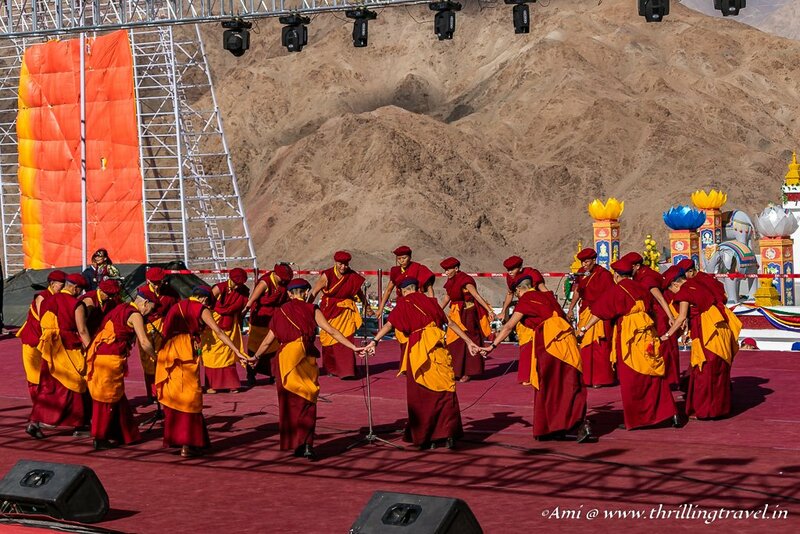 The people, the performances, the rituals and the heritage – it all came together to be one unforgettable experience. 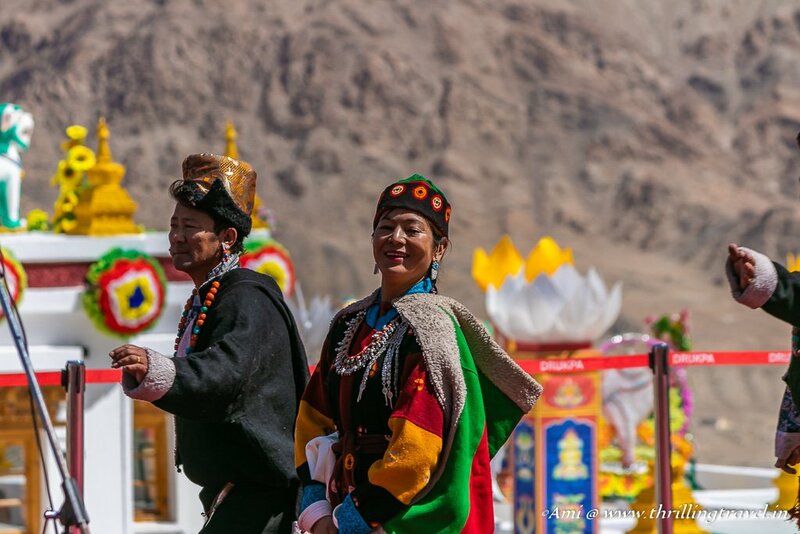 Let me share it all with you so that you too, can plan your visit to the Naropa Festival in Ladakh the next time. Every festival starts with a legend and in this case, the legend was a man born in the year of Monkey. He was the man who meditated near the Lamayuru monastery that I had visited earlier. A scholar from the Nalanda University, he came to Kashmir to spread his knowledge. In his quest for enlightenment, he was guided to a grand teacher – Tilopa. It is said that he had to undergo 12 tests of hardships before he was blessed by his guru Tilopa. Once he achieved his enlightenment, a Dakini visited him and presented him with 6 bone relics of Buddha. These were a crown, a necklace, earrings, bracelets, seralkha (a chest ornament) and an apron. Mahasiddha Naropa had many disciples, among whom was Marpa. He bestowed these ornaments to him when Marpa attained enlightenment, Along with the same, he prophesized that these would remain with his lineage and will be used as devotional support. 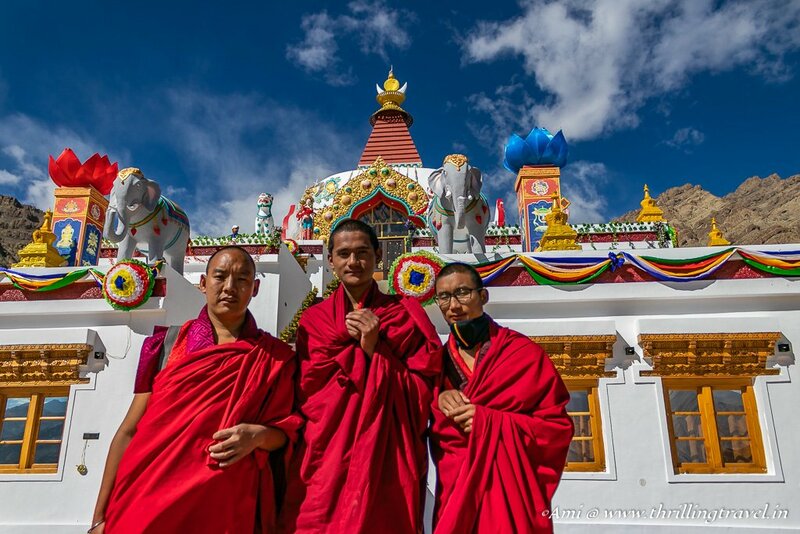 The present-day Drukpa Lineage is said to be the Naropa lineage and hence, the guardians of the precious relics. For years now, these relics are used for devotional support, and it is said that a worthy seeker can get enlightenment by merely seeing them. Every year that corresponds to the Chinese year of Monkey was celebrated in a grand way. 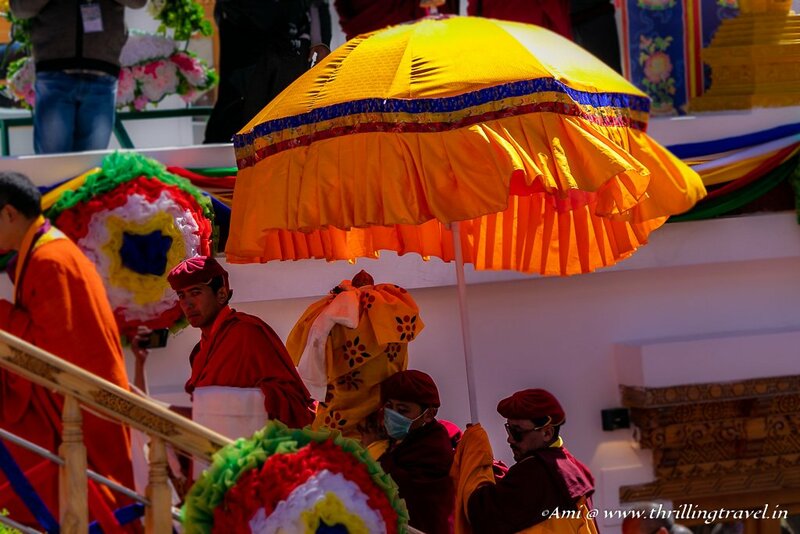 During this festival, the head of the Drukpa lineage dons the 6 ornaments and appears in public. In the last one, which was 2016, His Holiness Gyalwang Drukpa, considered a reincarnation of Mahasiddha Naropa, wore the same. This year onwards, it was decided that the devotees would not have to wait for 12 years to see the relics. 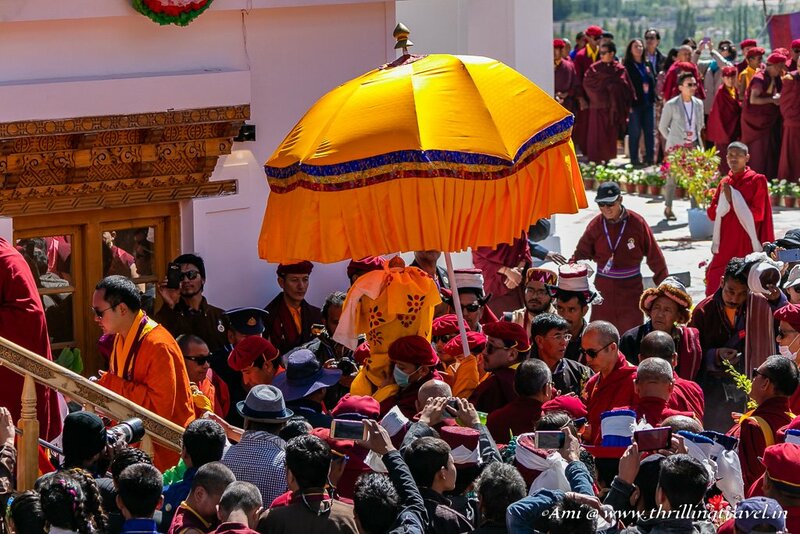 Every year would see a Naropa festival – with the Monkey year doubling up as a Maha Kumbh Mela of the Himalayas. 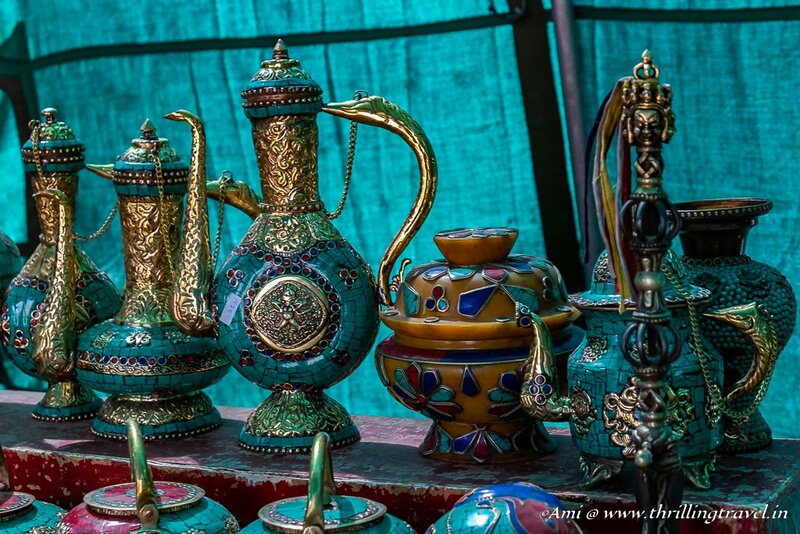 Every year, one of the relics, in rotation, would be kept for public display during the festival. And thus, every year the devotees would be able to view these divine ornaments. 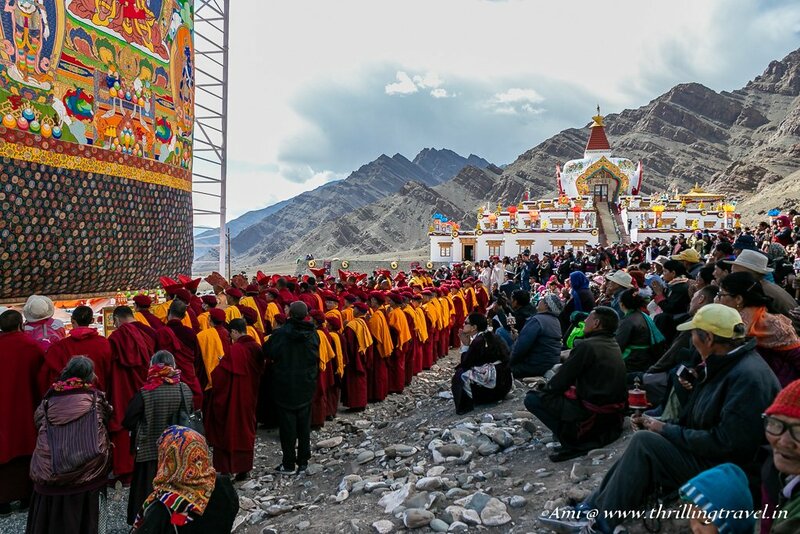 A special stupa was built 2 kilometers before Hemis Monastery to commemorate the grand celebrations of 2016. This is called the Naro Photang and this is where the current Naropa Festival was held. A gorgeous white structure against the Black snow-peaked mountains of Ladakh is definitely a sight to behold. 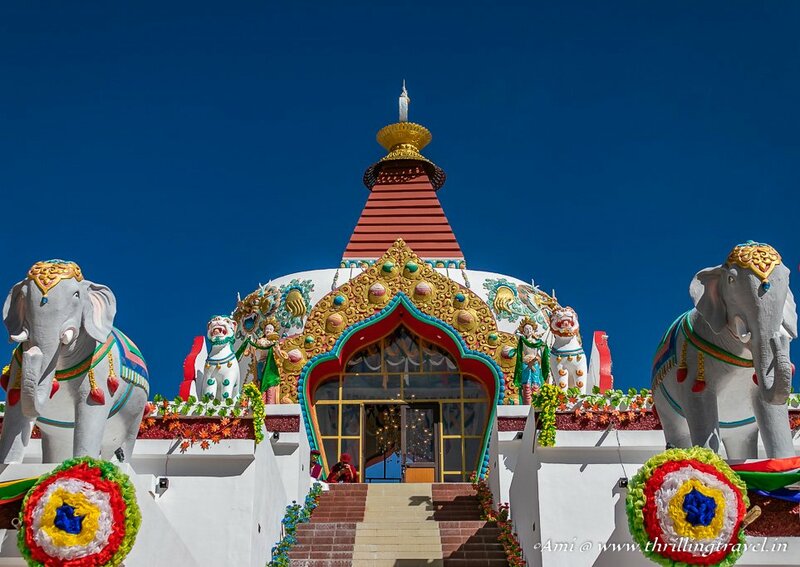 Add to that the colorful statues of Goddesses like Guanyin, decked with fluttering cloth, there was no denying that this was the ideal center point of the Naropa celebrations. The Naro Photang was where the relics of Buddha were displayed. When I reached there for the festival, it was not yet open. However, the preparation for the arrival of the relics was evident as I witnessed the red Monks scurrying around. A complete class of monk kids sat around and cheered in amusement as the visitors sat amidst them to take their photographs. And soon, there were people lining up at the entrance of the Naro Photang. It was time for the famous relics to arrive. 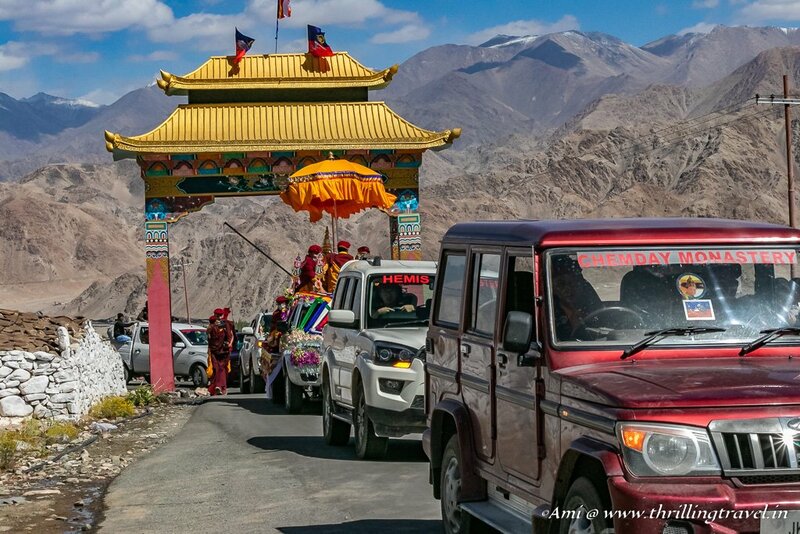 Far along the winding roads that led to Hemis Monastery, I could see some colorful vehicles approaching the Naro Photang. Faint notes of flutes and drums increased the anticipation in the atmosphere. All eyes in the waiting crowd were trained towards the approaching procession. Everyone was eager to catch the first glimpse of the relics. A cheer in the crowd greeted the first vehicle that entered the gates of the Naro Photang. Kids clapped as they drove past. Everyone strained to see which of the six relics had arrived. However, the suspense continued for the relics were covered and taken out. 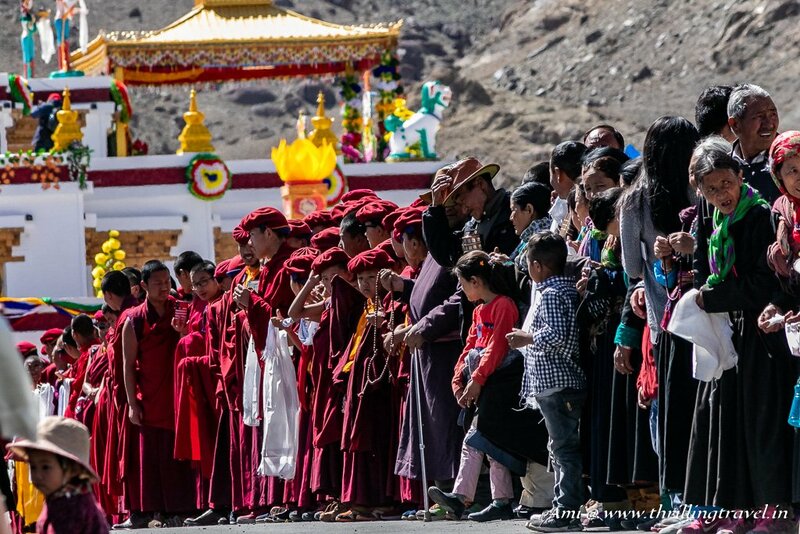 Accompanied by the Monk Musicians, the relics were taken around the Naro Photang and finally, up the stairs to the display center of the Stupa. Unveiled, I got a quick glimpse of it – it was the crown of Naropa on what they say is the real hair of the Buddha. I wasn’t allowed to take a picture of the same and was in fact, shooed away to the stage area of the Naropa Festival. The Naropa Festival was declared open with announcements of the various projects that were undertaken by the Drukpa team. It was interesting to note the kind of social work that the community was involved in. To encourage entrepreneurship and employment, they had a Naropa Fellowship program. His Eminence Drukpa Thuksey Rinpoche shared the various plantation walks that were undertaken for a cleaner and greener Ladakh. During a meeting with him later, I found out the little things that they had already initiated towards green tourism. 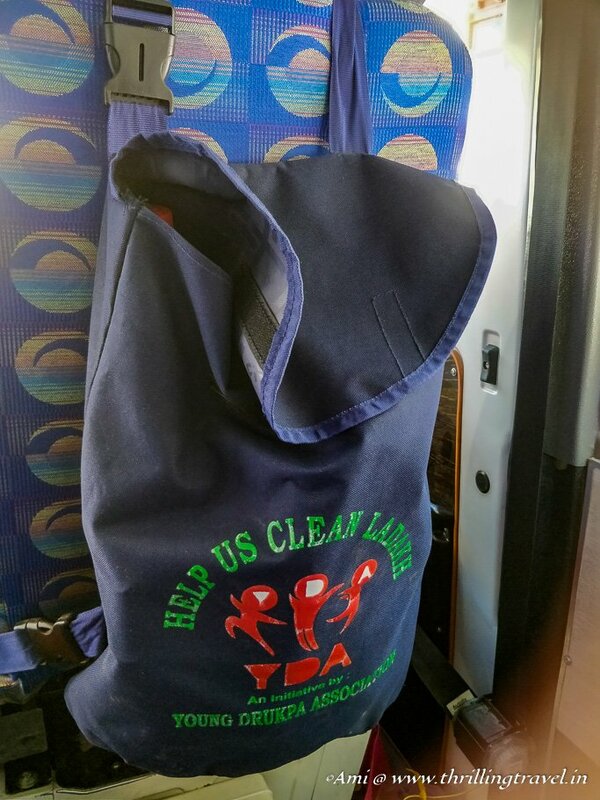 One of the simple things was to ensure that every taxi in Ladakh had this little dustbin bag for the tourists to throw their rubbish in. It was the local taxi driver’s duty to ensure that the bag was emptied in the right place. 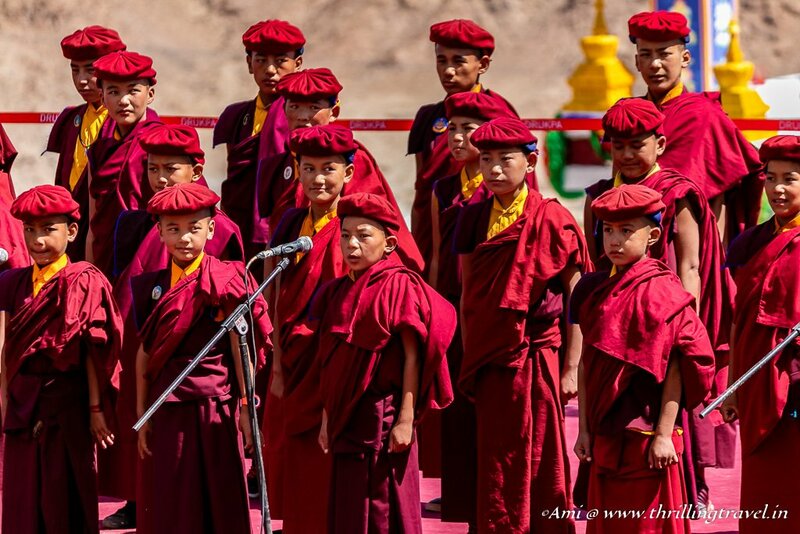 Once these announcements were done, it was time for some fun-filled performances by the monk kids. 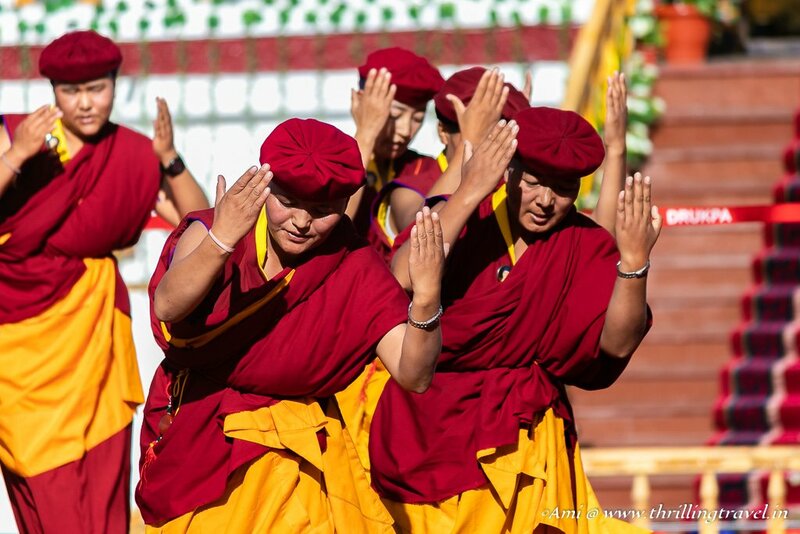 The famous Kung-Fu nuns of Ladakh too, danced to some beats. 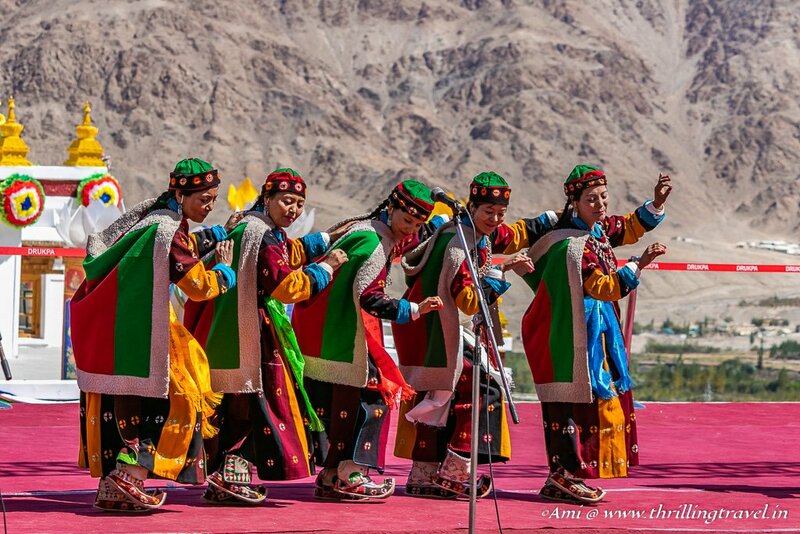 The traditional mountain dances of Ladakh enthralled the crowd with their rhythmic moves. On the following days of the Naropa festival, there were other programs like the Archery competition that kept the crowd entertained. And then, on each day, there were the Pop stars of Bollywood that took over as the sun went down. For me, Day one of Naropa Festival was about the Procession of the Relics and the performances of Naropa Festival. However, Day two turned out to be a little different. As I arrived at the Naro Photang, a huge Buddhist Amitabha or what is popularly referred to as Thangka Painting was unfurled. 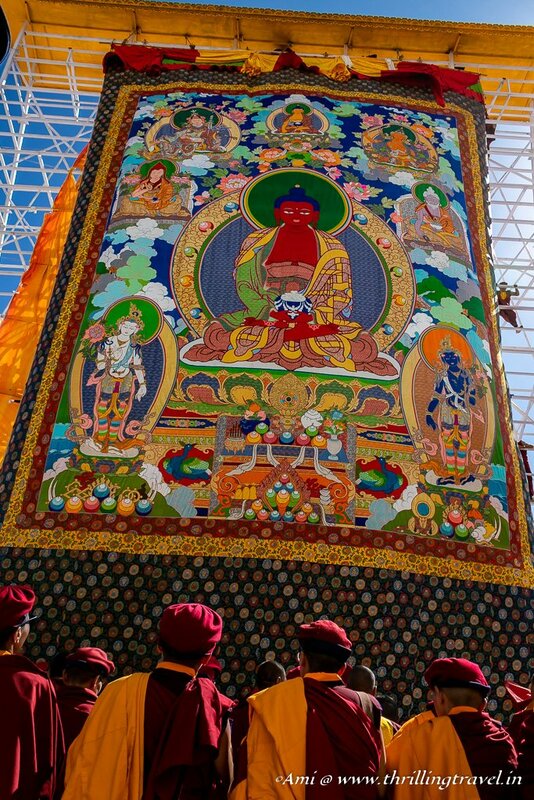 This embroidered piece of work is the largest Thangka in this region. If you cannot picture 70 feet high, then you need to just imagine yourself looking up at someone on the 5th floor. Now that high was this gorgeous piece of work that depicted the life of Buddha. The unfurling ceremony was quite an experience with the monks and nuns all lined up in front of it. Behind them, stood the various devotees with their chosen form of offerings. And as soon as it was uncovered, the monks broke into a melodious chant, lending a certain serenity to the whole atmosphere. With the initial prayers done, the Thangka altar was open to the public who came forward and put in their form of offerings. From food to money and even water, every one of them came forward to seek blessings. As the crowd lined up to see the relics of Naropa, I joined my team of media journalist for a quick visit to the Hemis Monastery. It was kind of befitting to see the home of the lineage of Naropa. In fact, I would say it was quite illuminating too!. As I returned to the Naro Photang, I saw the Thangka being covered again – only to be unveiled the next day again. Even the covering up of it was quite an interesting sight. Interesting food trucks and make-shift tents with the wares of Ladakh added to the fun element of the Naropa festival. 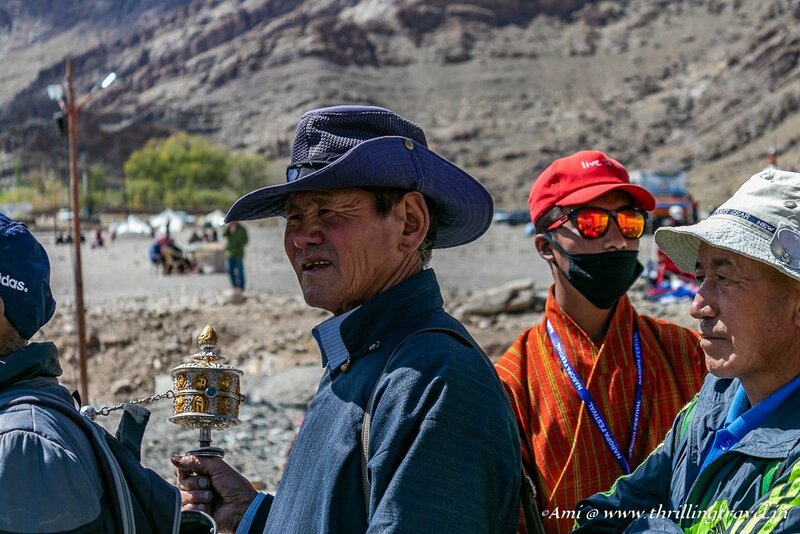 The scores of Prayer wheels, pretty necklaces and ear-rings, woolen scarves, colorful vases and bronze idols – there was plenty to take back as a memoir of this Ladakh festival. With a bit of bargaining, I found that I could buy these for a reasonable price. 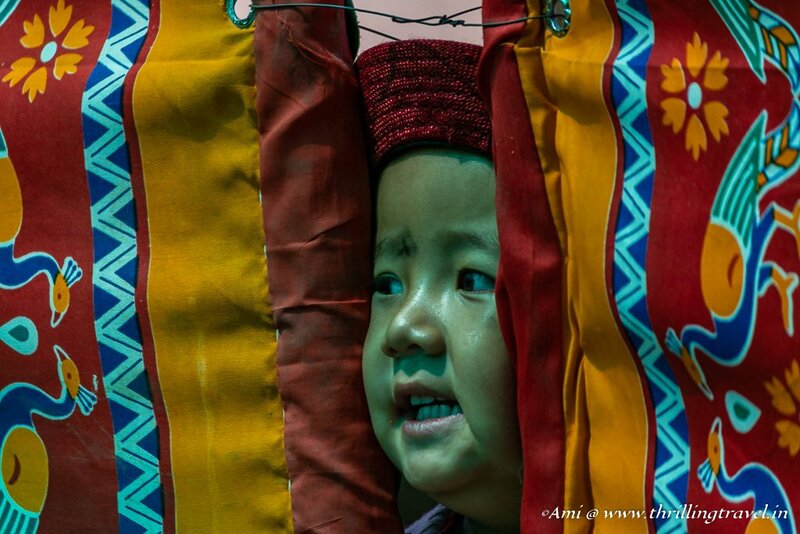 Along with the shopping, it was interesting to capture the faces of Ladakh. From toothless grins of sweet oldies to the shy and cheeky faces of the little kids, I had a blast photographing them. 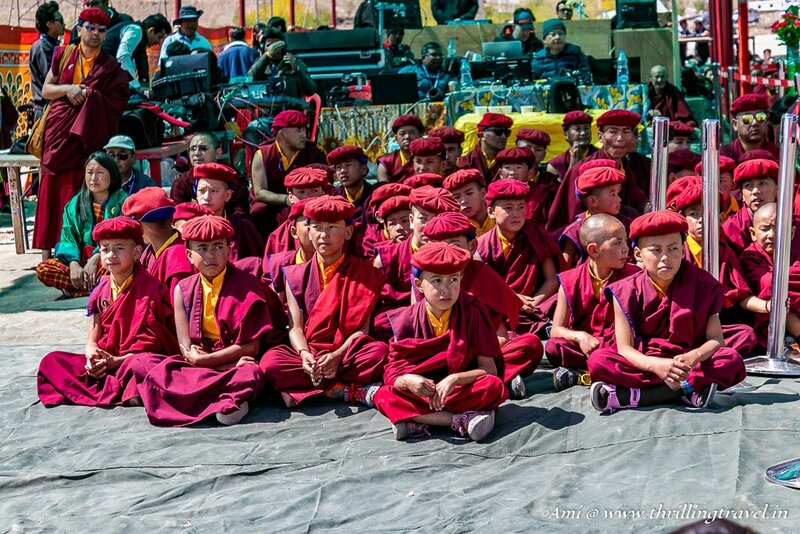 Naropa Festival definitely, is a riot of colors – whether the people, the decor or the cultural rituals itself. In fact, it is a part of Ladakh that one must experience. It adds that flavor that makes this part of India unique. I am pretty sure you agree and if you do, then you sure will need this pin to mark your visit for next year! 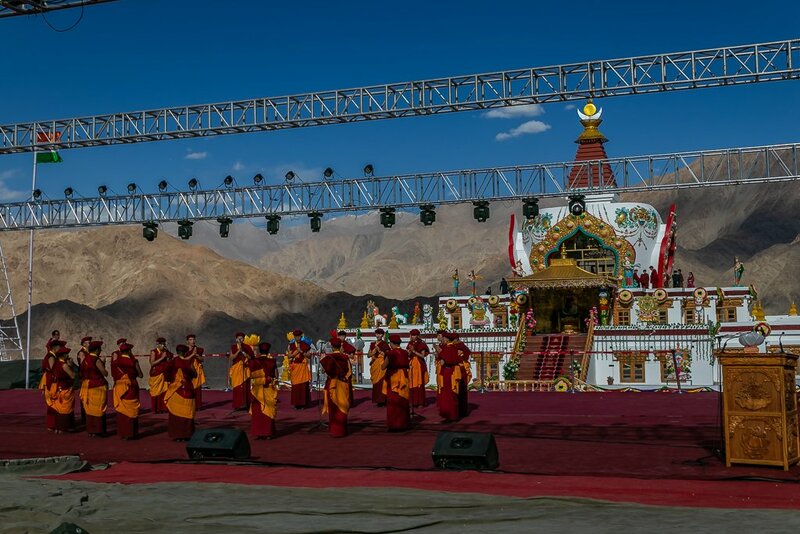 Naropa Festival takes place at the Hemis Monastery in Leh. There are direct flights available to Leh from Delhi and Mumbai. There are no trains to the place. The only other way of getting here is by road. Refer to my Travel Guide for Ladakh for further information on how to get to Leh. 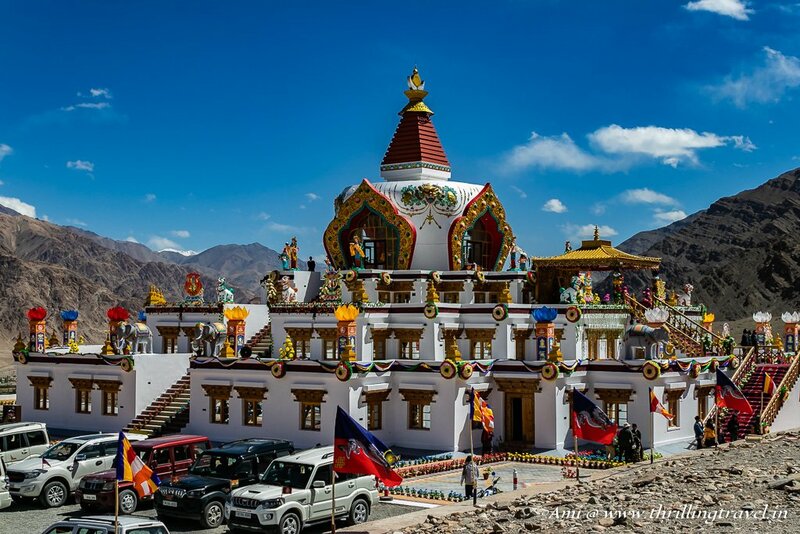 To get to Hemis Monastery, you will need to hire a cab from Leh. 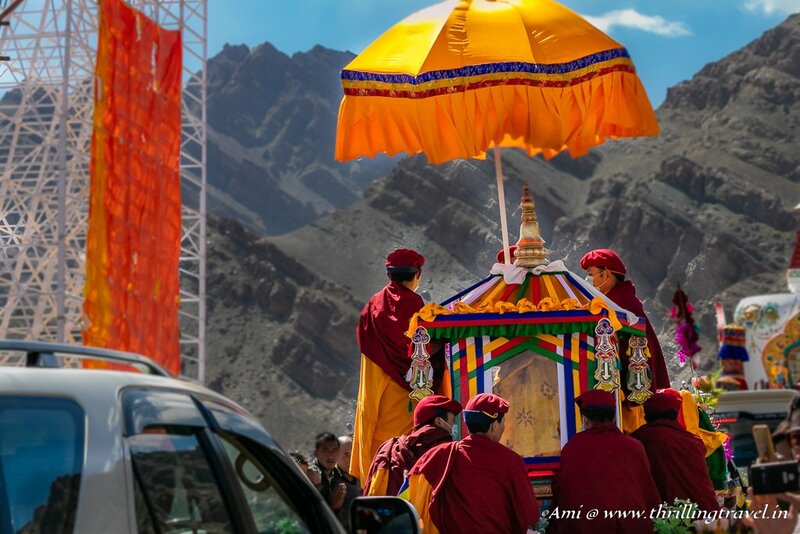 There are several tour companies in Ladakh that include a trip to Hemis Monastery in their Ladakh itinerary. Naropa Festival takes place in September every year. There are no tickets or entrance fees to visit here. 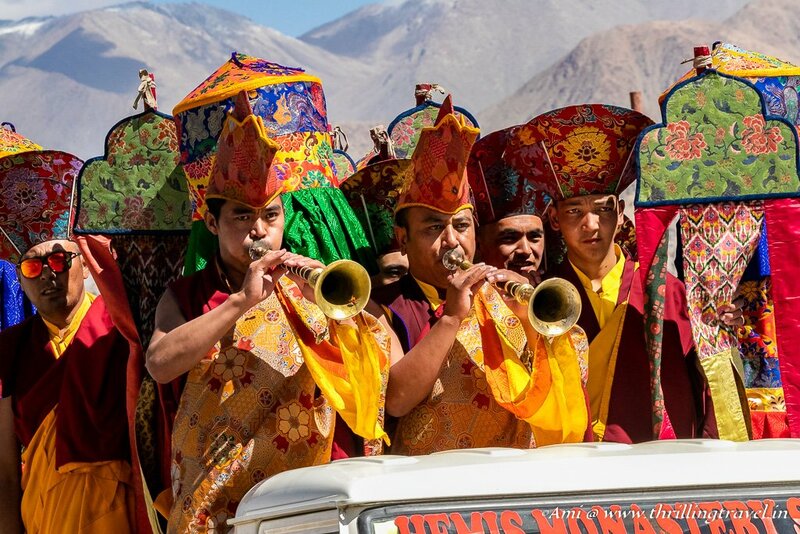 Combine this festival with a visit to the Hemis Monastery. There are make-shift rest-rooms and food trucks at the Naro Photang. There are no hotels near Hemis Monastery. 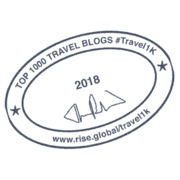 You can opt for some hotels in Leh and take a trip here as required. Please make sure you book these stays in advance as Naropa Festival does attract a lot of people. September is generally the onset of Winter and it can get pretty cold in Leh. Remember to bundle up in layers, especially for the evening shows. Mornings will be pleasant but expect harsh sun owing to the altitude. Ladakh trip requires a fair amount of preparation. I have put together a complete guide on this and you can access the same here. It tells you all about the dressing, weather, permits and more. The photos are so vibrant and lively. Ladhak undoubtedly has a raw and pristine charm, but these pictures just added a new dimension. Fantastic. Rightly so, And now that you know about it, I hope you can plan for the next year. Looks like such a vibrant and lively festival. I can almost hear the beats of the music through your photos – which are beautiful as well by the wall. Thanks for an interesting post, was lovely to read. Wow, This look like an incredible trip of a lifetime! Your pictures looks fantastic and this place is so beautiful. 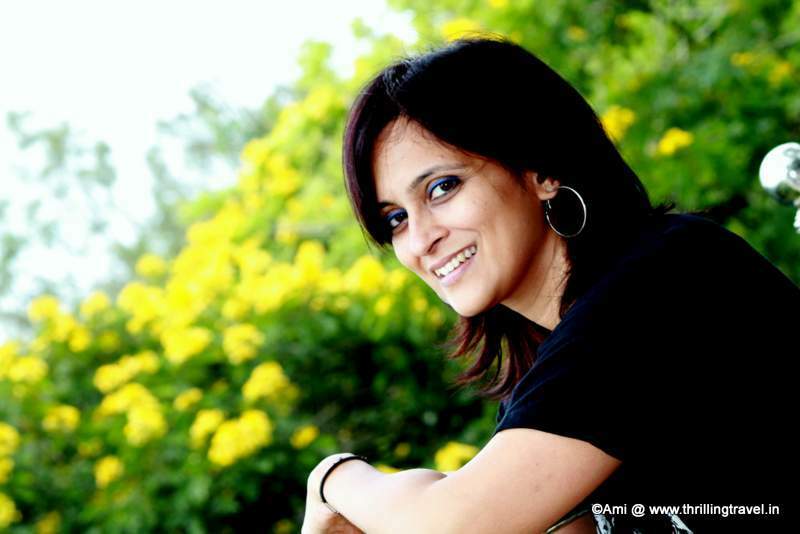 You shared great information about these festivals. Loved this! Thank you so much for sharing a wonderful experiences. Wow! This is such a beautiful festival. It would be great to be given the chance to attend and experience this wonderful celebration. Thank you for sharing about it. Also, love your photos. I became jelous reading this. 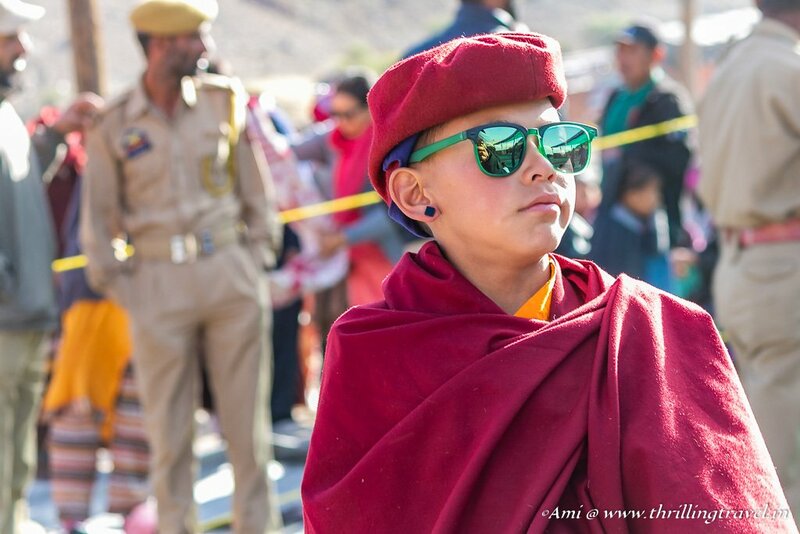 When I was int his part of the world I didnt have neought ime to come to Ladakh, so reading another post is just making me want to go there again. THanks for the inspiring pics! I hope you can visit here soon. Ladakh in particular is so unlike the rest of India. Plan it to coincide this festival so that you can visit and enjoy it as well. What a gorgeous and colourful festival! I love that 70ft piece of embroidery, I can only imagine how stunning it is in person. I’ve never been here, but would love to visit one day and hopefully see something like this. 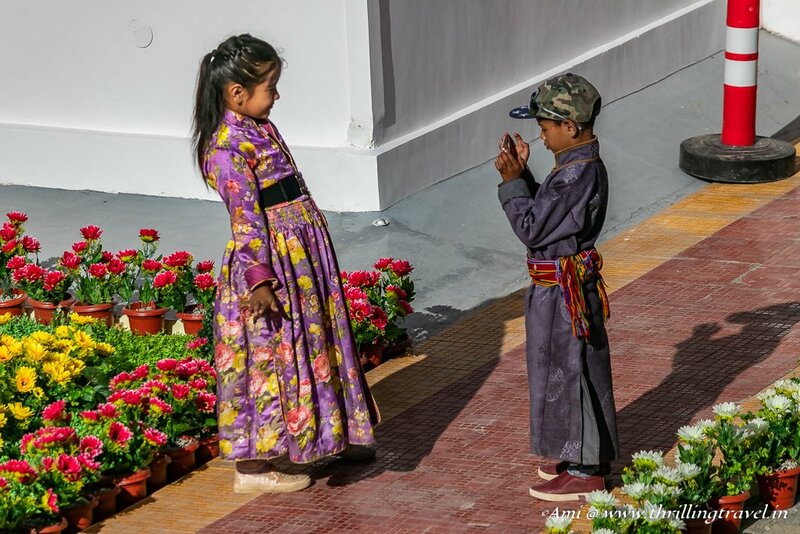 It’s always great learning about a new culture and capturing it in memories too. Thank you Lisa. The Thangka did take me by surprise. Naropa in general was just amazing. I hope you can plan a visit coinciding that and see it for yourself. OMG this festival is truly colorful, no doubt! 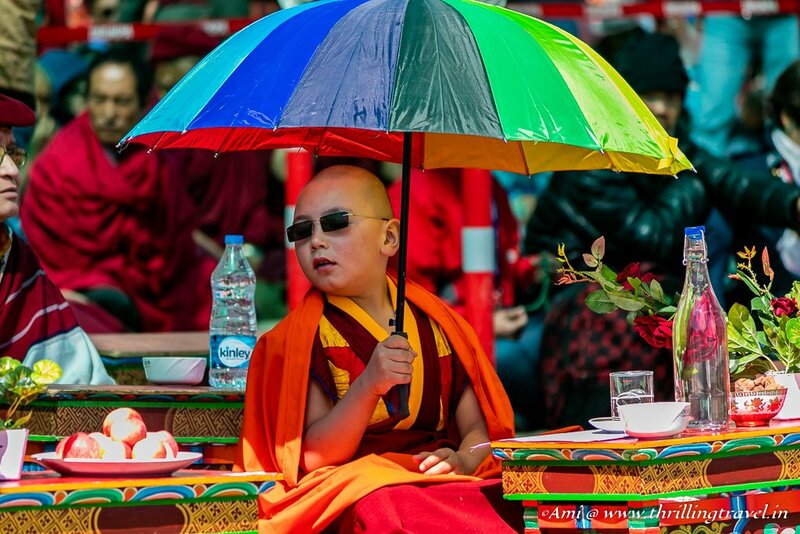 That young monk wearing his sunglasses looks freaking cool AF. 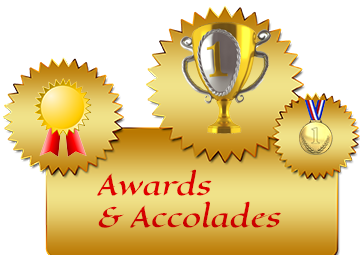 It was awesome that you got to experience its fantastic celebration. That cool dude was just amazing! And then there were more. I hope you can visit it next year. Trust me, you will love it. Great information with beautiful pitchers. Thank you for sharing. Wow, Hemis Monastery is truly a sight to behold. It’s so intricately designed and beautiful that it’s hard to even imagine standing before it in real life. I would love to see the performances there, and I’m really glad to hear that the festival is instituting green measures! It’s so important to focus on eco-friendly measures especially for large events like this because there are so many beautiful places around the world that are being destroyed by tourists! 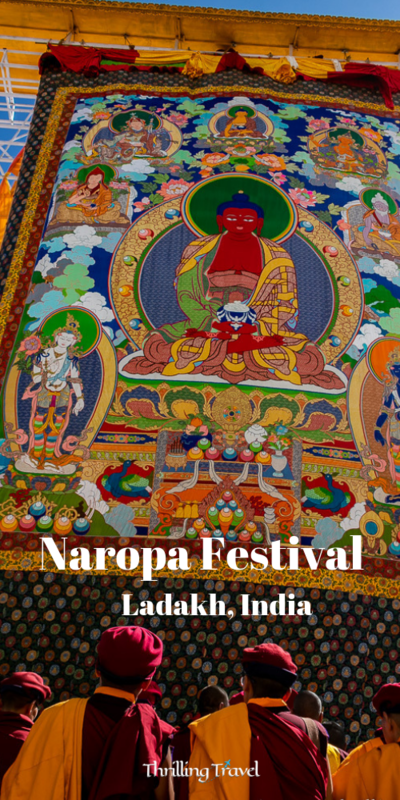 this is really amazing.so much colorful and vibrant.So detailed information on Naropa festival.thank you for shaing. Thanks Mayuri. Am glad you enjoyed the read. Fascinating to see the vibrant pictures and learn about the origins of Naropa.